Throughout life many of us will be blessed with a special privilege of sharing our lives with very special people. Very rarely however will many people honestly say that certain teachers, mentors and very close friends are “God sent” to teach others, to play well with others and laugh and share good times together as a unified Soul Cluster while they are still in mortal form. We ourselves consider ourselves to be very, very blessed and very, very honored to say that of all the men and women we have interacted with over these many years, one person whom we dearly love stands out among all the best. It is with great joy in our hearts, our true admiration and our deepest wish for all the best FOR the best, that we honor a special Soul this day. On the afternoon of March 13th. 2018, our dearly beloved longtime friend, colleague, ally, comrade in-arms and one who too knows how to keep secrets when it is necessary, Dr. Verling CHAKO Priest, Ph.D., quietly and peacefully passed over into a finer version of herself. Our Chako was 2 months away from her 91st. Birthing day. Through all the years of our private conversations, our shared laughter and our commiserating with one another when we would watch Advocates and those soon to be new Advocates fall into the Mind Field, we three would bolster one another’s morale by speaking of all those “who did make it away from the Mind Field and just kept on going onward while being upward bound..” We laughed about many of the antics people indulge in on their way to Higher Learning of the best kind. We knew Chako long before that was her name, way back many millennia ago when we three sat with Jesus and Mary Magdalene where there too we all traded stories of things past and things yet to be. Very few people of today are aware of all the emotional pain Chako endured in order to write the books that NEEDED to be written. Very few people here today knew how deeply she suffered as she was cruelly alienated from so many people she sought to help. Chako has been here several times with us since she left the Earth Star planet. She was a bit weak but that was to be expected because of her chosen lifestyle. However, she is now surrounded by all the Higher Divine Beings who cherish her as much as we do and as much as you should. Our Chako gave her all and yet in her innocence never understood that her all was more than enough. We ask you one and all to Light a candle each day and celebrate eternal life with her. She will soon don her Mantle of Greatness. We ourselves will know when that happens and we will celebrate her long stay here on this planet each day for the rest of our lives. Many of you will never realize while you are incarnate how much less meaning you would have had in your lives if it had not been for Chako. Chako is a prime example of Living AS a Life Lived Well. Kudos Chako! We salute you for WHO you are and ALL that you have accomplished. We will meet you again in a better place at a better time. If any of you are interested in reading any of Chako’s 15 books you may wish to pick up your copies while they are still available. We have always been in touch with her and yes, of course especially since she passed over. She has visited us several times already and she has truly earned her Mantle of Greatness. Chako was surrounded by an enormous bevy of Luminescents as well as by her own other Guides and Teachers. When her Soul arose to begin her journey home the scent of white roses was very beautiful and still is. The rose scent seems to be with her and around her at all times. We are very happy about that. Anything you or any of the others in the Metaphysical groups, friends and so forth want us to post for them, please tell them we will be most happy to do so. Yes, we knew she would hesitate before leaving mortality, but as you know she did the right thing and we are thrilled that you were there with the other person as well. She has so many special gifts and like the phoenix she will arise again and again in all her glory and we will always be there for her. Thank for sharing that beautiful testimony about Chako. I enjoyed learning from her books and her channelings with Jesus… especially the last books she brought forth with Him on Transitions. Many of her writings correlate with your God Books. Your postings of many excerpts of her writings also were profound. I noticed the timing of Chako’s transition, so just saying, Celest, you were involved with everything with David, things with ……, as well as the death of your very good friend. Just saying, you were going through an awful lot, and if you can do it, we can do it, and if we can do it, other people can do it. That is my thought on this. I am glad Chako Priest had a good transition. Sad to know for all this who miss her on earth. I so much enjoyed reading her books. Even many of her difficulties with her eyes and even previous lifetimes were described in one of the books. Great to hear more of the history of her relationship with Celest and David and her own life evolvement. I had to think things overnight, to come up with a reply to your email to me. Sometimes, I have to let go of the thought process and find the heart process to come up with an answer. I truly miss Chako’s messages that she sent out, though she has transitioned, some of her messages still resonate with me, especially about the children, as children and animals are what are very close to my heart, as well as all of Nature. Could we please skip the 4th of July? (a little sarcasm). I understand that there is messages under messages. So I FEEL that I can relate to Chako to the extent of not being accepted by most peoples. I am mostly fine with that, however, sometimes, I find a great longing to connect with those where I feel I am accepted. One of those places is with the Advocates, however, even there, sometimes, I get a little push back. Oh Well! I am not going to not speak out any longer, thank you for that. On another note, I looked out this morning, again, to see if the moon was the same. It was. I was shown, and if I could draw, I would send you a picture, that it is not even 3 dimensional, but the word given to me was, omni-dimensional, with the light beams prominent all the way through the moons body, circular, and spinning rapidly. I am sending you a telepathic picture of this. I feel I am leaving something out and do not know what it is. Your special message was a beautiful tribute to Chako Priest. 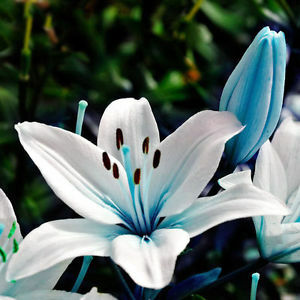 I will say I’m sorry for your loss even though it sounds as if you are still able to see and communicate. You two have had much change in your lives in the last few months. I feel the three of you are such great role models. I aspire to be my best as I get to know more of the two of you and now Chako Priest. My greatest desire is to be in service as you three. It’s inspiring to hear Chako’s story as you have written it and it has set my heart (hope it’s not corny) but I want to say on “fire”. We will be gathering on another “Gatherings” conference call! Please join us as you are able. After reading Chako Priest’s book entitled “The Faces Of Ascension”, which was my first glimpse into her heart (so to speak), I would like our group focus (at least part of it) to bring our open and loving hearts and as a group send her as much Light, love, and gratitude as we can, as a tribute to her life here and beyond. Thank you! It will be done! Just reading one of her books, I’ve felt as though she was a true embodiment of what a “mother’s” love would be. Both loving and determined (passionate). So much innocence as you stated in the article. Incredible role model! Thank You for all the special, channelled books from You – I have many of them and still read in them from time to time, when I need an answer to issues in my life. Take Care and see You Again, at another ‘time’ and place! During last night’s conference call, as we shared stories of some of our favorite books Chako Priest wrote, Wiesje mentioned a chapter on Mother Mary that was a favorite and was not sure which book it was in. If you have access to “Masters Tales Of Now” you can find God and Mother Mary Chapter 2 page 7. It’s a great read a few pages long very well written and easy to understand on living in the NOW. Thank you, Wiesje. Remember Janet, NOW is a compilation of past, present and future spatial timing of all things happening simultaneously. It is difficult for many people to understand this but it is true. All happens at the same time. There is NO segregation on living lives ALL at the same time! Do you see? Yes. It took some pondering. So everyone is playing out their dimensional level all at the same time others are living theirs. So knowing when to walk away from those who are not learning but using your energy because you have the light. Help by role model but not as a Savior or martyr. And just as I answered it came to me. In the NOW present to the very activity or pondering allows one to see all choices and pick the response. Thinking out of the box and bringing truth forward. Changing evolving forward and upward. All is present and a choice. This morning I awoke early being lead to write what came to me about Chako raising early as her many writings came through for her to share with us all. I feel blessed to have been introduced to her many messages from her books. With coming into our circle of family and having the privilege of being connected with both of you Celest and David and Chako it has brought more openness to my Soul reading the words and feeling the energies that came through Chako. I bless her on her continual path and know she is still with us on many levels even more deeply. Thank you Chako, Celest and David for all that you are. In much love and gratitude for being open to being here in our Golden NOW. 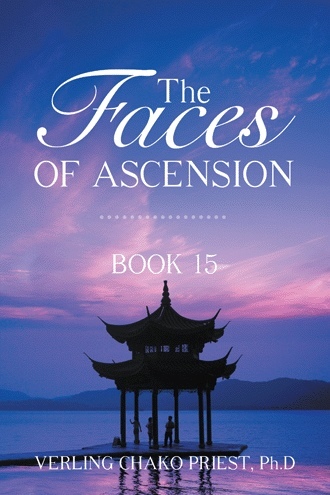 THE FACES OF ASCENSION is a book for all ages. It will tweak your outdated belief systems and jump start your Ascension ambitions. Verling (Chako) Priest, Ph. D. has channeled an intriguing BOOK 15. The Faces of Ascension. Sananda/Jesus has brought forth 8 Masters and God, the Luminescent. Each describes the various faces of Ascension. The Masters: Saint Germaine, Mother Mary, Gautama Buddha, Kuan Yin, Mary Magdalene, Ashtar and Djwal Khul, Mother Earth- Gaia, Kuthumi, and God give the readers new teachings for the path to Ascension. Each Master presents a different aspect/face–giving, receiving, joy, laughter, love, perseverance, and many more. Adversity, while mentioned, is not a face but a catalyst. Verling Chako Priest is a telepathic channel for The Masters. She holds four degrees in higher education, two in psychology and two in transpersonal psychology. “Transitions” is her thirteenth book. Dr. Priest lives in Sun City Grand, Surprise, Arizona, and has been a channel for over forty years. She has also been a contributor to God’s books in the “The God Book” series which are received by Celestial Blue Star of the Pleiades and David or Arcturus from God and all the other Luminescents (Luminescents – the Gods and Goddesses from all the other Universes). She will continue to do so in the upcoming Book #8 of the series “Avatars in the Valley of the Ancients” which will be published later in 2017. By Verling Chako Priest, Ph.D.
Verling Chako Priest, Ph.D. has once again channeled an extraordinary book. Eleven Entities who reside in Heaven come forth and tell their death processes and entrance into Heaven. 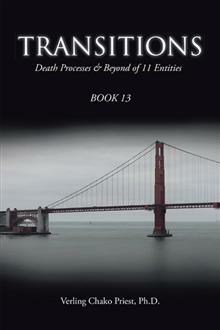 In BOOK 13 (Volume One) the Entities were all male. In BOOK 14, the subjects are all female. Their deaths are varied from being ejected during a car crash, to asphyxiation from C.O.P.D. and nine other descriptive accounts of the women’s passing. The death experience does not always involve a tunnel. Some of the Entities just become aware that a woman is with them (Angel) guiding them to a Care Center where they are healed after sleeping a few days to a few weeks. Another constant is each individual reviews his life on a huge screen. Many others are viewing their lives, but they are unable to hear or see the other lives on those screens. This book will trade old beliefs for new ones—the pearly Gates and gold roads are an illusion. You do not need to eat or drink; that is your choice as you evolve. Souls reincarnate when they choose, or are nudged to return. 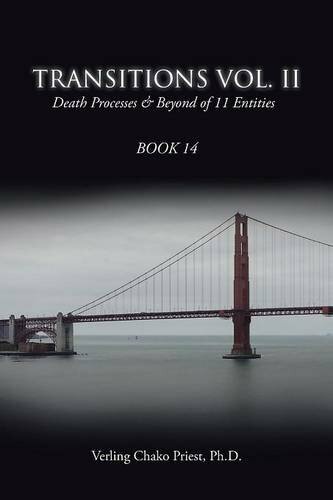 “TRANSITIONS Vol.II, Death Processes & Beyond of 11” Entities is a book for all ages. It is definitely a page-turner! She has also been a contributor to God’s books in the “The God Book” series which are received by Celestial Blue Star of the Pleiades and David or Arcturus. She will continue to do so in the upcoming Book #8 of the series “Avatars in the Valley of the Ancients” which will be published later in 2016. A full list of Chako’s books can be found in our “Recommended Reading” section on the Awakenedhearts.com website. 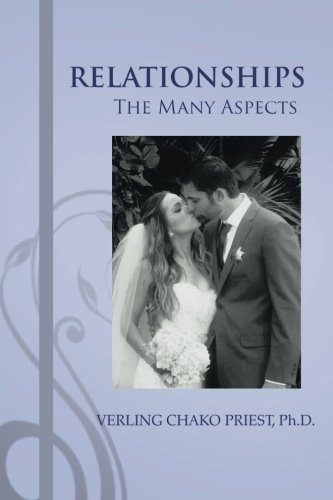 On 01-28-15, Jeshua and I gave the “Relationships” book presentation to the Wednesday Metaphysical Group that meets in the Unitarian Church in Surprise, AZ. The following is the translation from my recording. I address the group and then go into my channeling mode. There are many new people here, so I thought I need to go back and bring everyone up to date. I lived in Minnesota for 11 years. I knew I was to move from there but did not know how it all was going to come about. In the early part of 1999, my daughter and her husband flew up from Arizona to visit me. They told me they had bought property in Sun City Grand, Arizona, and when the house was finished being built, they asked if I would move there and rent it from them. I said I would, which surprised my daughter, for she did not think I would be open to such a change in my life. However, when the Masters want you to move and provide the way, your choice is clear. Move! I arrived in Arizona on November 14, 1999. It took me a while to settle into my new home and to get back into my routine of meditating every morning. One morning, I felt this soft caressing on my cheek. The room was electrified. (I need to say, now he is coming very close and right into my heart and I become kind of a blubbering idiot. Angel can attest to this when I was bringing in a message for her. I was crying so hard I could hardly speak and give her the message. Lynn Christina, who has spiritual sight, added there was a big golden aura around me as I spoke.) To get back to my story about the caressing finger, I was still so new about all of this that the only thing I could think of was to ask, are you Jesus? He replied, no, but he is an aspect of me. Wow, I thought, this must be Sananda making a connection with me. The vibration was so high that I had to go take a shower to calm myself down. So that’s the end of that little story for now. One morning I woke up and felt something kind of funny at the top of my head. Something was entwined in my hair. I pulled it out, and it was a large paper clip. I got the symbolism of that. I was going to be clipping many pages of paper together. It all came true, for this is my twelfth book, and I go through paper clips like crazy. This book is called Relationships. The front cover picture is of my grandson Matthew O’Brien and his bride Elizabeth. I thought this wedding picture would make a perfect cover for my book. Usually I can finish a book in 3 months, but this time the process went on and on. I had a reading with Adironnda, channeled by Marilyn Harper, on January 22nd. I asked her to check out where my block was. Why wasn’t I able to bring this book forth as swiftly as I had the others? I just felt I was procrastinating too much. Adironnda said no, that was not the case. What was happening was as all this new energy came in throughout the year 2014, my body had to integrate it and recalibrate it. This happened with each little segment or chapter. When all was ready to go forward, Jeshua would nudge me, time to get back to the book. I then would bring in another chapter. This went on chapter after chapter after chapter, to the point where I thought I must have a block that was holding things up. But Adironnda said that no, that was not it at all. That was nice to hear (chuckles). The different Masters that came forth each had a segment in the book on what it was to be in a relationship and what was required. Saint Germaine talks about giving and receiving. (I thumb through the pages and read from the Table of Contents.) You know when I wrote this so long ago, I kind of forget what the Masters have said. It is kind of embarrassing (smiles). C’est la vie. Serapis Bey talked about kindness. Djwhal Khul is known as the Tibetan from the Alice Bailey books. He hid his name for a long time and then let it be known and now many channel him. He spoke of Transitions. Then God came in. People often wonder whether people can channel God. Of course you can; anybody can. God had an interesting analogy: when I was a little girl, it seemed as if I was always falling down. My knees would frequently have these huge scabs on them. Then I would pick at them. You know how little kids will just pick, pick, and pick, showing the new skin underneath the scab. Well, God used that experience as an analogy for what happens when we have a problem in our relationships. He said to let the scab form and then pick off a little piece of it and see the healing underneath. I thought gee, that’s a different way of looking at it—healing a conflict in a relationship—let it form a scab, then pick off a piece and address just a segment at a time. Mary Magdalene did a chapter on Acceptance and Djwhal Khul continued his remarks from chapter 4 on Transitions. Commander Ashtar talked about the Galactic Command and when they are on the spaceships and about relationships that have to take place. There are hundreds of people on those ships. The motherships are miles and miles in diameter. They are like a living city. Therefore, there would need to be compatibility in relationships on those huge motherships. OK, I can’t think of anything else I need to tell you about the book. Just feel free to come up and take one. All right, let me wipe my nose (laughter) and then we will see what Jeshua wants to say. I am one of these people who likes to channel with my eyes closed; I do not want to look at any of you (laughter). Now Heather is thumbing through the book, and if I were channeling and saw her doing that, my mind would lose focus and my ego would kick in and I would not be listening purely enough to what I am being told. So if I just shut you all out and concentrate on what is being said, I can bring in the message more clearly. OK, Angel, let’s see if I can get through this without crying. This reminds me of when Marilyn Harper channels Him, the tears are just streaming down her face, so I am not the only one who reacts like this. He already told me that we would have a large crowd which is very nice to see. And Lynn, you are seeing what? Your aura is gigantic and just golden all around. I am watching to see the various changes. Hmm, and that’s His energy. Oh boy, I am going to cry. I always settle in after a minute. My precious ones, I am Jesus the Christ. I come often to this group. In fact I am here every Wednesday. Chako is kind of a pillar to this group as she was here almost at the very beginning. Jean Alexander is another one (also Lynne Ormandy). Since Heather came—she was called here actually. Chako was having a problem with the editing of her book, so we found her an editor—pretty soon here comes Heather. Ask and ye shall receive. As I look around you, I just wish you could see your auras. They are just magnificent. You know some people, I could say most people, think they have acted a little selfishly, or not giving, not loving and they berate themselves. But we say, that is being human. Do not put yourself down. The energies are very difficult at this time. Most people are in the 4th dimension. You know, there are 7 levels to each dimension. Therefore, you could be down here (moving my hands down) and others could be up there (moving my hands upward), but still in 4D. Others could be in the 5th dimension. So it becomes a learning process as to what you are going to run up against in order to move onto another level. What I am wanting to emphasize is that you are not alone. Everyone is doing this. Everyone has times where he or she thinks ooh, I am a bad person. (I am exaggerating a bit here.) But basically he or she is thinking, I could have done better. I am saying that if you will come from love—if you will bring more love into your heart—all you have to do is to go back into your heart and name what it was you did, acknowledge it and let it go. You have not sinned. There is no sin. I hope you all know that by now. There is no sin! Now I know several of you are Catholic and I do not want to get into putting your religious beliefs down, but religion has played such a part on this planet and not always correctly. We will not go into all of my Biblical experiences, but the Christians were not all that loving either. You can go to churches even today and there will be squabbling in the counting rooms. People will pilfer the money—even today! There is something about money that has a pull on people. But again, I would not call that a sin; that is just a learning experience—learning what is a higher energy and learning what is not. Love—just know that love is the answer. Now I have not said anything particularly enlightening, shall we say, so I would like to bring in Saint Germain. He is always absolutely delightful. Hey, hello Group. I am Germain. You know, the guy who lived in France, was in royalty. Those were the days. If you did not behave yourself, they just chopped off your head. Now that was a learning experience—although I managed to keep my head. It was interesting for us to watch as Chako brought in the chapters for the book and to see the struggle that she was going through. It reminded me of people who are struggling to maintain their relationships. There are many times when they are just snowballed with it all. They do not know what to do, where to go. In this now-a-days generation, you go to a bar and get drunk in order to forget all of your troubles. There are so many addictions. During my time in France, we did not call them addicts; we just called them drunks. They drank very heavily and sweated through the heat. They were always overdressed. I think I told you this the last time I spoke with you. There was a lot of perfume used to cover up the odor (chuckles). I will step back now as God is waiting in the wings. My beloved children, I hope you will let me in your heart and not just mouth the words. Know that my love is real. I love you unconditionally. It is always such a joy to me when people save some time to just sit and commune with me. You know, religions have put such a formality on addressing me. It always has to be just so. Whereas, why cannot someone come forth and just plop down and say, hi God, how are you doing? This has been an awful day for me. Just have a dialogue. But people are afraid to do that. They are so programmed to act just right. I am giving you permission to let go! Be yourself. There are some women in church who feel they must be dressed up and wear a hat instead of just sitting at home in their jammies. Therefore, I greet you this day and know you are always in my heart. I will turn this back to Jeshua right now. I bless you. This is Jeshua back again. We have one more who wishes to speak. She is the love of my life, Mary Magdalene. Or if I were Sananda right now, she would be Lady Nada, the higher energies. Hello Group, I am Mary Magdalene. If any of you have read, Anna, Grandmother of Jesus by Claire Heartsong, you would know of my relationship with Chako. We were Essenes together and as we matured, we were both in love with Jeshua. But I got him (chuckles), which was meant to be. You see, Chako had a rather interesting life. My grandmother’s daughter Rebecca was Chako’s/Mariam’s mother. She died from leprosy. Mariam’s father was so upset that he went off to another spiritual group that was just for men at Qumran. He stayed there the rest of his life after putting Mariam into the hands of Mother Mary. So in essence, she raised her, and Mariam became not only a cousin/sister but a beloved companion of Jeshua. There is such a connection here that she still carries that sacred number of 33. Why am I telling you this? It is because most of you in this Wednesday group were Essenes! We all knew each other. We would have some squabbles among us… (A cell phone’s silent vibration was humming which distracted me and I lost my train of thought.) Let’s see where was I? Now people have read a bit about the Essenes and may have fantasized about this group. Yes, we were very spiritual, but life was similar to when some of you may have gone to summer camp and were assigned to various jobs that needed to be done. We took turns with that. And I am talking about cleaning out the latrines. Do you think that sanitation area was not going to be attended to? We all took turns cleaning the latrines. We took turns harvesting the fruits and vegetables, chopping them up for salads. We took turns harvesting the nuts on the trees—drying them and preparing them. Our grandmother Anna was a very firm taskmaster. There was plenty of time for laughter and play, but when she was serious, we were serious. She taught us much. One of the main things we were taught was the value of being in our heart, the value of love. So many people today do not know how to love. They have a shallow heart. They do not know how to get deep enough. When they are in their love, it can turn possessive and controlling. We Essenes were taught how our love needs to be pure—a direct connection to God. You do not control love; you do not possess people with it. I think I have talked long enough, so I will step back now and see if Jeshua has more or less a closing statement here. I am Jeshua again. What I am looking at is how many of you can channel! Come on, girls and boys; get into that heart; open that third eye; open up those mental areas, the chakra in back of the throat and let’s hear some channeling from other people. It would be very welcomed and fun. You could practice on the Group. That would really be fun and nobody would judge you because everyone else is scared to death too! (Laughter) It is not easy sitting in front of people. That’s why Chako closes her eyes (chuckling). When she first started doing this, I would say to her, it will be alright. I will be there; we won’t leave you with egg on your face. In other words, she would not sit here ready to channel and none of us would turn up. All right, my friends, I will step back now so that other people in the Group may share. I never come alone, so I say we all the time. So I will say that again. We love you so much. And thank you for coming. If you did not come, we would not have a Wednesday Group. How boring that would be. Just know that we Masters are here every Wednesday, hoping that you will show up. I will step back now and I bless you; oh how I bless you. Take it in; take it into your hearts; take in the love that is being given. Lynn, did you see any changes? She answers, very subtle ones around your head and shoulders as each one came in. But mostly it was huge, beautiful, swirling golden Light all around you. Can’t get better than that (chuckles). And each one of you is capable of doing the same. All right, beloveds, have a wonderful day. For information on all of Chako’s books go to http://awakenedhearts.com/2011/08/27/chako-priests-books-the-ultimate-experience-the-many-paths-to-god-series/ and here you will find how to order the books direct from the publisher. They are also available at Amazon and other outlets as well. All of her books are now available in both E-book as well as paperback and some of them are now available in hardcover as well.